Today was a most unusual day for me. 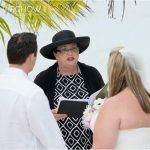 We had two weddings planned, one was a fairly large cruise wedding with lots of extra services, the other was a simple Registry Office wedding for a local couple. I was sitting at the Haagen Dazs cafe reading my Kindle and waiting for my bride and groom to meet me so I could get their Special Marriage License, and take them down to my office to get dressed. A woman came up to me and said something about getting married. At first I thought she was talking generally, and then I figured out she was saying she and her fiance wanted to get married today! Her stars must have been aligned or something, because everything just fell in place. 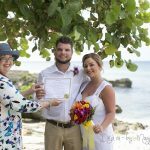 Sometimes brides spend over a year working with us on their destination Cayman wedding, and this one just fell in place in ten minutes. I sent the bride and groom down to the office to see Peggy and get the legal requirements done, and set off to do wedding number one, my big group from Washington DC. 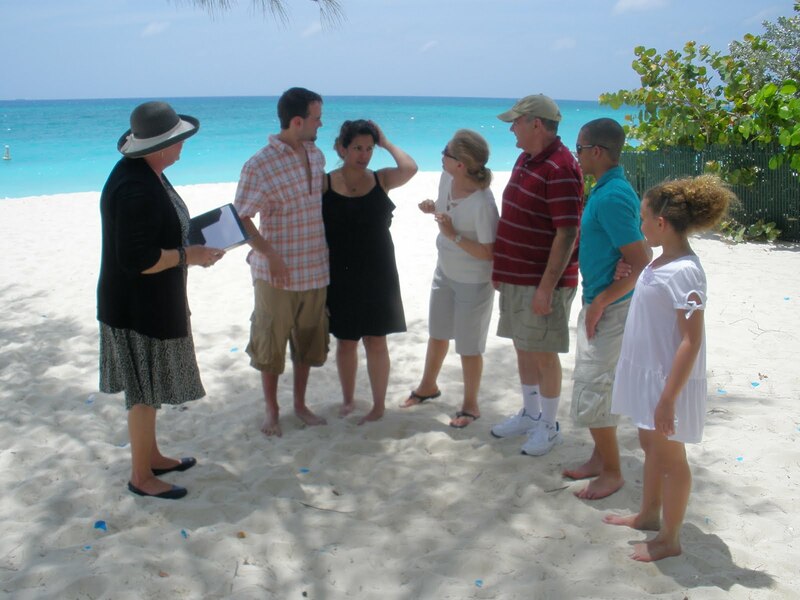 In the meantime, the bride and groom returned to their ship and got the bride's parents to come and be their witnesses. They visited one of the local jewelry shops where they bought the wedding ring. They then took a taxi to the wedding location, where I was to meet them at 1 p.m.
Grand Cayman Island is one of the few places on the western Caribbean cruise-ship circuit where you can be married while you are on the island for just a few hours. There is no residency requirement, no blood test. 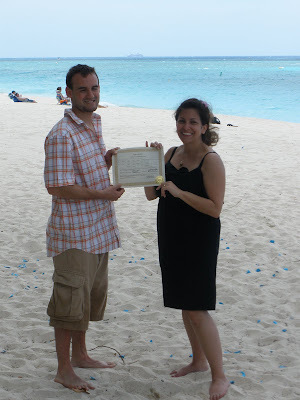 All you have to do is to have the correct documents and a Marriage Officer to do the ceremony. For this couple, due to luck and circumstances, their impromptu wedding just fell in place. 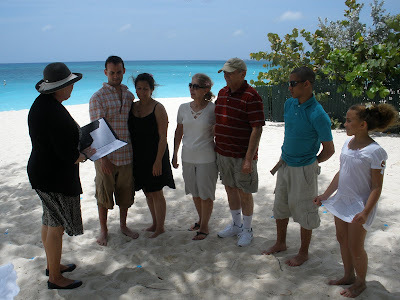 In most instances I do only one cruise ship ceremony per day, particularly if the planned wedding includes a large group and many details. 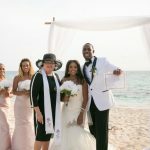 I do this because I dislike rushing my couples, and it is most important to me that the bride and groom enjoy their experience in the Cayman Islands. I get many, many referrals through word of mouth, and comments my couples make on Cruise Critic and Trip Advisor. So if you are happy with the service provided by Simply Weddings, please take a moment to share your experience with your friends and co-workers and of course on your social networking sites like Facebook, Twitter and MySpace. You can share this and any article on my blog by email and other sites just by clicking the "Share" button at the end of this article. 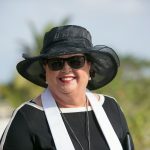 You will find me on Twitter under Joy of Weddings, and do become a fan of our Facebook page, Simply Weddings - Grand Cayman Wedding Celebrants and Planners. 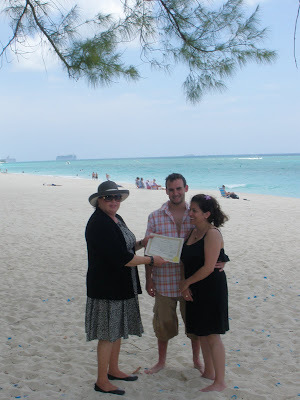 We are now booking Grand Cayman cruise wedding packages and vow renewal packages through 2011.